It's always funny to me when people talk about Labor Day being the end of summer seeing how in Arizona we don't really have much of a fall, that and Arizona started back to school the beginning of August. Our seasons are: Summer, "Winter" repeat. Fall is pretty much just skipped over all together no matter how hard the stores try to sell those fall colored wreathes and pumpkin lattes. So the idea of the last day of summer on Labor Day has always made me think people have no idea what they are talking about. Summer continues at least through October! Haha. But now being on the mountain I understand it. While the days are still warm the nights are quite noticeably chilly and the idea of hot drinks and a bonfire are perfection. We put the last weekend of summer to good use with our friend Shaye. 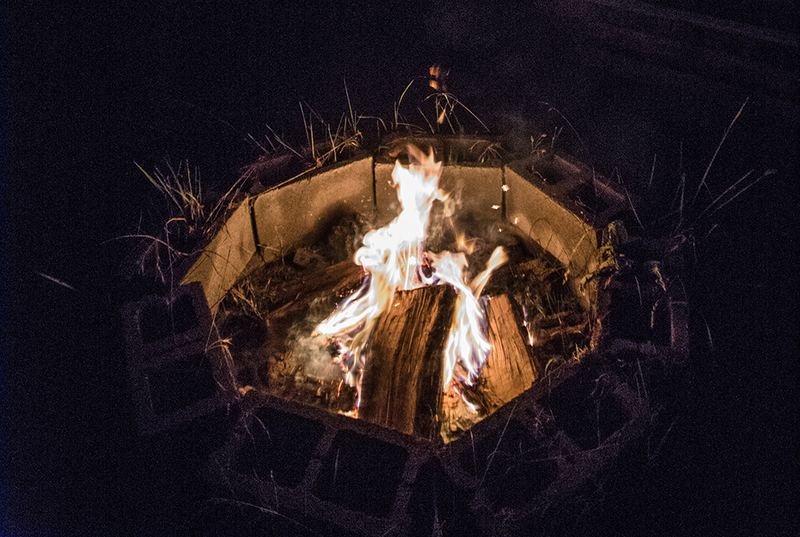 There were trips down to the river, hikes in the mountain, light graffiti, and bonfire fun. Oh, and their was entirely way too much homemade pizza, waffles, and smores. I'm not complaining, nut my waistline might be haha. 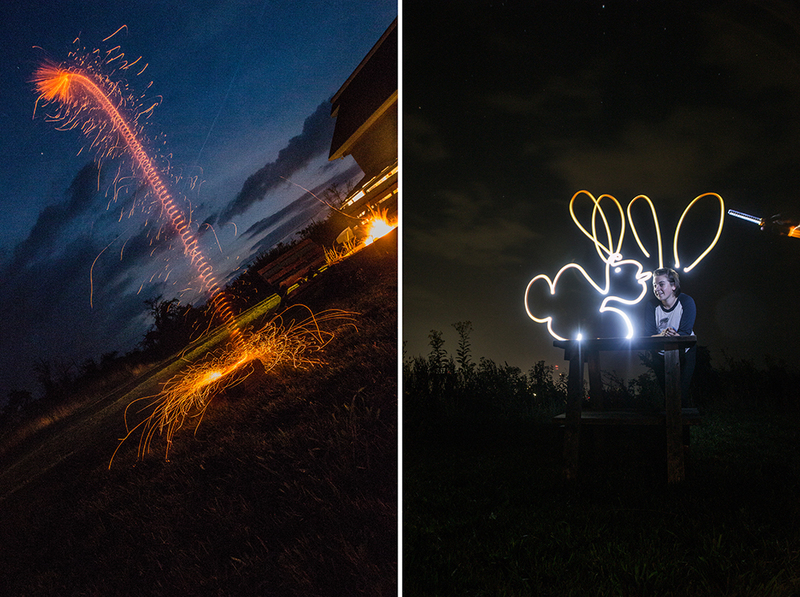 Light graffiti is seriously one of my favorite things to do, it's just so fun and silly! I mean, how often do you get to make it look like a dinosaur is eating you, be a sea captain, or even get a kiss from a giant bunny?! If you guys are ever looking for something fun to do some night you should give it a try! What did you do over the weekend? Did you have any big send off for summer? This looks so cool! I need to do something epic before summer ends - thanks for the inspiration! I'm in the same boat as you: endless summers! I've never done light graffiti but it looks like so much fun! 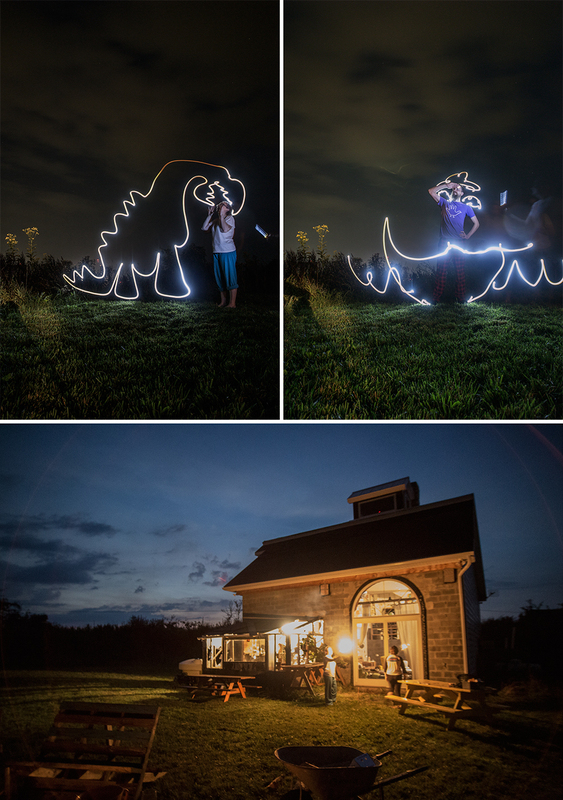 YES oh my butterfly, these are some of my favorite light painting photos now, oh gosh, that dinosaur is so silly! This makes me wanna get outside tonight with a light pointer. Looks like you had a blast - the light graffiti in particular looks so cool! Oh my god those light graffiti photos are amazing! I definitely need to do some more before the 'summer' ends! Unfortunately up here in Illinois, we definitely will be seeing the end of summer soon, haha! That light graffiti looks rockin'. I've never tried it before. Fantastic photographs! in the UK we don't have Labor day, but we do have a Bank Holiday the previous week which is seen by most as being the 'End of Summer'. We definitely DO have Autumn over here. In fact, I am pretty sure it is Autumn most of the time in London...! I'm a new reader of your blog and I can't wait to have more of a nose around! Those light pictures are AWESOME!! The dinosaur photo made me laugh out loud, haha! Brilliant! I love those photos! How on earth did you do that? I'm super stoked that summer is coming my way, though! Hello beach. We live right near it so we'll often go down there with the 4WD, park up with a few beers and watch the sun set. Ahhhhh, bliss! This pictures are awesome! I've always wanted to try that! Looks like you had a glorious Labor Day! Those light graffiti photos look SO COOL. Oh my god, making light graffiti just made its way to the top of my bucket list. Also, here in Southern California we don't have much of a fall either, or winter for that matter. But I enjoy the warmer weather and the opportunity to keep dressing up in my cute summer clothes for as long as I can! Glad you had a fun Labor Day weekend! Greetings from Sydney, Australia! We said good-bye to winter instead (which I did by quickly hanging out all my piled up washing in hopes we would finally get some sun!) I just discovered your blog, and I look forward to backtracking. Light graffiti is intense, I have to admit I have never seen it before! So that's where our summer is going, hehe :) I hope you guys have an absolutely lovely summer this year! You should give the light graffiti a shot, it's pretty darn fun! Light graffiti is so ridiculously fun especially if you are doing it with a bunch of friends. If you ever give it a go and post photos I hope you will come back and share the link with me, I love seeing what people come up with! It was a pretty great time! Hope you had a great weekend too! You totally should, it's really fun!! Thanks! And yes that is our house, which is a very big work in progress, one day we will finish it (hopefully hehe). Sparklers would be so much fun with the light graffiti, I will have to remember that for next time. Oh and trust me just because we are in AZ during the fall/winter months doesn't mean I don't partake in all things pumpkin, haha! IT'S THE BEST! Light graffiti is pretty darn easy all you need is a camera that has a bulb feature, a flashlight, and night. Seriously so much fun, even if the pictures don't work out, hehe. Hmmm maybe I will do a post about it? That one is definitely my favorite too! Thanks! Seriously too much fun was had! Thank you! If you ever get a chance to do some light graffiti of your own I highly recommend it. Thanks for stopping by, so happy to have you here! Oh man it seems like summer is ending sooner this year, or maybe it's just me. If end up doing some light graffiti I would love to see what you come up with! It's really wonderfully fun, if you ever get a chance you should try it out! The dinosaur is my favorite too. I honestly think it's a combination of practice and some luck when it come to light graffiti, but it's pretty fun even if the pictures don't come out perfect! Oh man you totally should! I would love to see what you come up with if you end up doing some of your own! With endless summers the temperature is always right for light graffiti :) You should totally give it a try, it's really quite fun. Thanks! We had such a blast so I am sure you would too! Yes! You totally should! Make sure to send me the link when you do. You rock.